Spend some time with these books for the past they illuminate, the present they elucidate, and the future they foretell. And please comment with additional books you think belong on this list! As Kendi provocatively illustrates, racist thinking did not arise from ignorance or hatred. Racist ideas were created and popularized in an effort to defend deeply entrenched discriminatory policies and to rationalize the nation’s racial inequities in everything from wealth to health. In shedding much–needed light on the murky history of racist ideas, Stamped from the Beginning offers us the tools we need to expose them—and in the process, gives us reason to hope. In a profound work that pivots from the biggest questions about American history and ideals to the most intimate concerns of a father for his son, Ta-Nehisi Coates offers a powerful new framework for understanding our nation’s history and current crisis. What is it like to inhabit a black body and find a way to live within it? And how can we all honestly reckon with America's fraught history and free ourselves from its burden? 4. 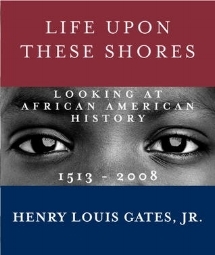 Life Upon These Shores by Henry Louis Gates, Jr.
From one of the co-founders of the Black Lives Matter movement comes a poetic memoir and reflection on humanity. Necessary and timely, Patrisse Cullors' story asks us to remember that protest in the interest of the most vulnerable comes from love. Leaders of the Black Lives Matter movement have been called terrorists, a threat to America. But these authors paint a different portrait, one of loving women whose life experiences have led them to seek justice for those victimized by the powerful. In this meaningful, empowering account of survival, strength, and resilience, Patrisse Cullors and asha bandele seek to change the culture that declares innocent black life expendable. Though not explicitly historical in content, this new release offers a firm reminder of how centuries of racist language, thought, and institutions persevere today, and their myriad ramifications on everyday life.